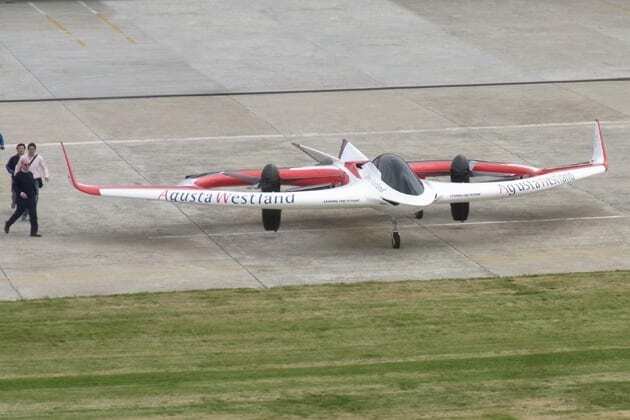 European helicopter maker AgustaWestland has unveiled the world’s first electric tilt-rotor aircraft and says it has already made several flights. Like the more famous Bell Boeing V-22 Osprey, the new electric aircraft can take off and land like a helicopter, but fly like an airplane. It’s called Project Zero, and it follows AgustaWestland’s belief that tilt rotor technology is the best layout for the future of fast vertical lift aircraft. Its first flight was made in Italy in 2011, and was unmanned completed while the aircraft was tethered to the ground. Additional untethered test flights have been made since then. The rotors are horizontal during take off and landing, providing lift via the thrust produced. During cruise flight, the rotors turn and act like propellers on an airplane, and most of the lift will be produced by the horizontal wing. The wing tips are detachable for missions when the aircraft’s primary use will be as a helicopter.